Embrace your softer side with hydrating botanicals in a rich, creamy base, beautifully layered with sheer, sensuous scent. This velvety moisturizer is enriched with shea butter, restorative vitamin E and extracts of calming rose, peony flower and balancing magnolia bark. Apply all over, and revel in an aura of unabashed femininity. Smooth, luxuriously hydrated hands can be yours anytime with this richly moisturizing hand cream. Enriched with emollient shea butter, antioxidant vitamin E, extracts of calming rose, peony flower and balancing magnolia bark. Keep it handy for quick moisturizing touchups. 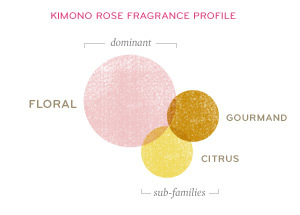 Elevate the simple act of washing your hands into an experience of unabashed femininity. This hydrating hand cleanser creates foam enriched with moisturizing glycerin and extracts of calming rose, peony flower and balancing magnolia bark. Create a sanctuary of scent throughout your home with unabashedly feminine fragrance. Spritz our room spray to make a statement that's soft spoken, yet striking. A highly evolved option to any standard air freshener.